The $2.5 million award, spread out over five years, will fund Grassellino’s research to expand her recent discovery of the cavity surface doping effect to a wide range of applications. The research will lead to enabling technologies for future superconducting accelerators used for a broad spectrum of scientific machines, medical uses, and nuclear energy applications. By doping the niobium surface of a 1.3-gigahertz, single-cell cavity with an impurity such as nitrogen gas, Grassellino and the Fermilab SRF team increased the cavity’s quality factor, or Q, the measure of how well the cavity stores energy, to previously unseen values. During recent tests, she measured a world-record value for Q, which was almost three to four times that of the next-highest reported quality factor of any accelerator cavity. Since many particle accelerators and physics experiments require a great deal of power, more efficient cavities will bring down the cost of refrigeration, often the most expensive part of running an experiment. The new technique can substantially lower the cost of operating high-energy particle accelerators. It can also make possible machines that use a lot of power, such as a future light source or continuous-wave beam experiments, that would otherwise be cost-prohibitive. She says the next steps are to deepen the understanding of why the technique works and to explore other options. Hasan Padamsee, head of Fermilab’s Technical Division, is a world-renowned expert in SRF technology. He finds her work intriguing. “Now it is just a question of translating that to large-scale structures, such as cryomodules,” he said. 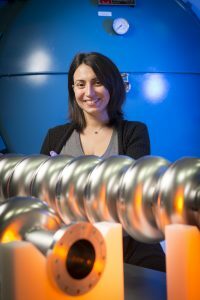 This is the second DOE Early Career Research Award for SRF researchers in Fermilab’s Technical Division in recent years. It will support Grassellino and two students and will provide funding for materials, testing and processing. “To have good quality researchers as part of the division is an important leg for the division to stand on,” Padamsee said.